What is the Nuclear Security Governance Experts Group? The Nuclear Security Governance Experts Group (NSGEG) is a diverse group of experts with nuclear sector experience who approach the problem of nuclear security governance from a variety of geographic, technical, and policy perspectives. The Asan Institute for Policy Studies, Partnership for Global Security, and the Stanley Foundation convened the NSGEG in 2012 to help generate a set of innovative policy ideas for improved global nuclear security. The NSGEG’s primary goal is to make the current nuclear material security regime more cohesive, responsive, and robust by the end of this decade (2020). In 2013 and 2014, the group released recommendations for strengthening global nuclear security governance intended to serve as a roadmap for improving the regime’s governance structures in the years ahead. The NSGEG also worked to encourage countries make concrete governance-related commitments at the Netherlands Nuclear Security Summit in 2014. Ahead of the 2016 NSS in the United States, the NSGEG is working to generate meaningful outcomes from the final summit, build support for the 2014 NSS Strengthening Nuclear Security Implementation initiative, assessing options for continuing progress and sustainable leadership after the conclusion of the NSS process, as well as continuing cooperation with the nuclear industry. 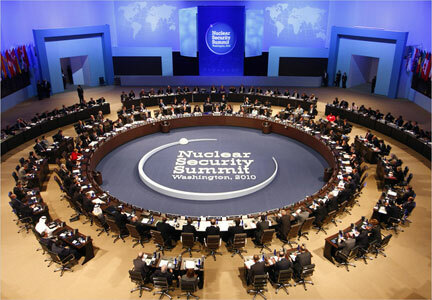 The Nuclear Security Summits (NSS) established global fissile material security as a top-level international objective and led many to consider whether today’s nuclear material security regime is adequately adapted to the twenty-first century’s globalized threat environment. While the regime has improved over the last decade, its development still lags behind other nuclear regimes for safety, safeguards, and arms control. The current nuclear security regime relies almost entirely on the national protection and control systems of countries that possess nuclear and radiological materials and facilities to protect the public from unintended releases of radiation. However, there is growing appreciation of the limitations of this approach and recognition that a more global, integrated, and comprehensive response is needed. The lead up to the 2016 NSS is a window of opportunity for global leaders, industry representatives, and nuclear experts to work together to develop new strategies and policies for improving global nuclear security. Seizing this opportunity will require defining an effective and obtainable end goal for improving nuclear security and identifying practical steps to reach that objective. This is a task that will necessitate creative thinking, better stakeholder integration, and political will among global leaders to break new ground.